Have to sat I am not a big fan of romance in war time stories. Unless there are wormholes involved. Now that has potential! 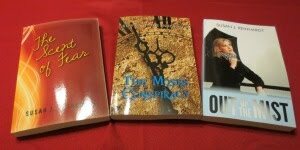 Long ago, I read the Thoene books set in World War II and the series they did on Israel. Loved 'em, but it's been a very long time since I read anything like that. Happy birthday, BTW. I wish you a real Olive Garden feast! I've been reading a lot about Sarah lately. I'll definitely need to check this one out! Hope you're doing well, Susan! Sarah's books would be a good place to start. She's an excellent writer, and her stories have oodles of romance. Really? I would think an element of romance might provide some relief from the war stories. Isn't Chase Manhattan going to have a girlfriend along the way? Even Superman had Lois Lane as a love interest. Alas, no "real" Olive Garden feast for me today. My friend wasn't able to join us due to illness, so Mom and I went to one of our usual places. I haven't read any of the Thoene books so far. My current to-be-read pile will keep me busy for many months. Great to see you! I know how busy tax season is for you. I think you'd enjoy Sarah's books. When her next one comes out, I'll be one of the first on line. Oh this sounds so good I have not read any war time novels, but I would like to. Thanks for sharing, this may very well be my first war time novel. Blessings. 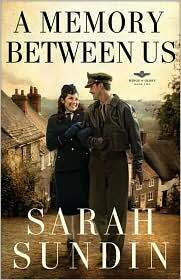 I LOVED Sarah's debut novel and can't wait to read this one too! She brings amazing storytelling skills with oodles of knowledge and writes so well. I read Civil War era books, but these were my first WWII books. Sarah did extensive research, and the end results earn the "Wow" designation. Thanks for your testimonial on Sarah's books. I think she has a great career ahead of her.